We bought a brass to elect. conversion kit, and the directions didn't show any pictures on how to connect the elec.plug to there adapter plate. Need help!! Nice Christmas present! But a little more information or some photos would be a great help. Are you installing sealed beams, halogen modern bulbs, other? I would guess you purchased the 12 volt halogen bulb conversion something similar to the one offered by Lang’s, Snyder’s and other vendors. I'm sure folks can help you, but a little more information would make it a lot easier. Also the suppliers often will answer your question. If you have the question there is a good chance others had it also. Good luck and don't get frustrated. You still have all the day light driving you want. And it is warmer during the day. Now how do I clamp the wire plug in that spring loaded round plate? Thank you for posting the photo. From looking at the parts and then going to Snyder’s and then Mac’s I would agree with Clayton – it appears to be an adapter kit probably from Mac’s [ looks like the one they have at: http://www.macsautoparts.com/ford_model_t/quartz-halogen-conversion-kit-12-volt. html#tabs-container which appears to be similar to the one Snyder's sells for Model A Fords at: http://www.snydersantiqueauto.com/uploads/A13007Q12-8339-xl.jpg and other vendors offer similar ones for installing the modern size Halogen bulbs in the 1915-1927 Ford electric headlamps. Depending on which type of headlamp you have or if you are trying to install them in something else – it will make a difference on how you align the bulbs. 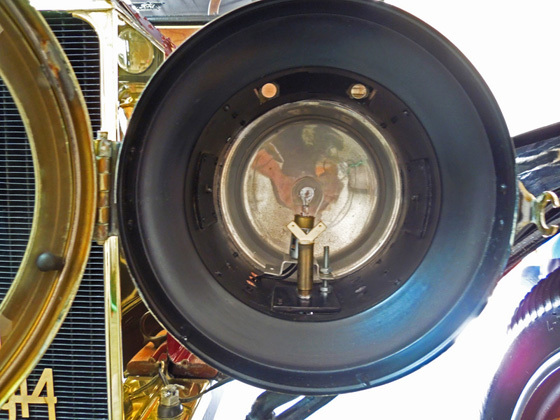 Disclaimer – I nave NEVER installed one of those kits – so once you confirm that is or is not what you are dealing with and that it is a 1915 – 1927 electric headlamp bucket – others can tell you “IF” my guess at installing it is close, correct, or out in left field. I believe the hinged clip is just to hold the quartz bulb firmly in the metal socket. 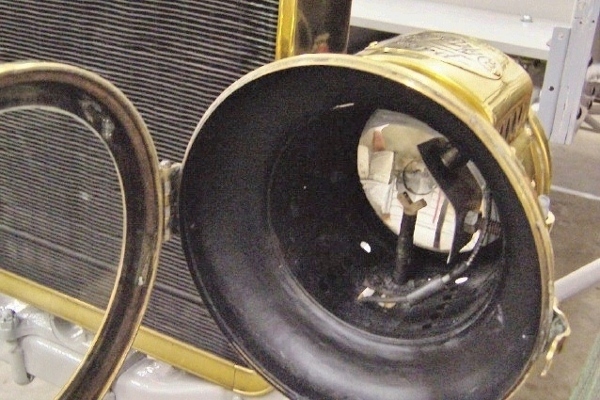 The metal socket needs to be placed into the back of the standard 1915-1927 headlamp reflector. 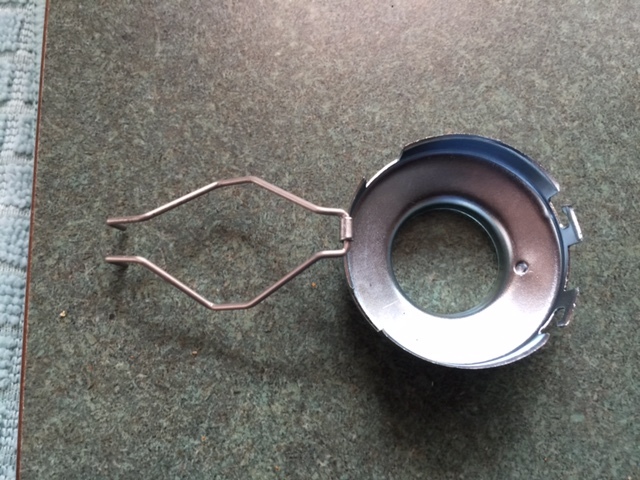 To allow it to fit, the hole in the center of the headlamp reflector will need to be enlarged. Note if your headlamps still have the original socket and adjusting screw and spring those will need to be removed. 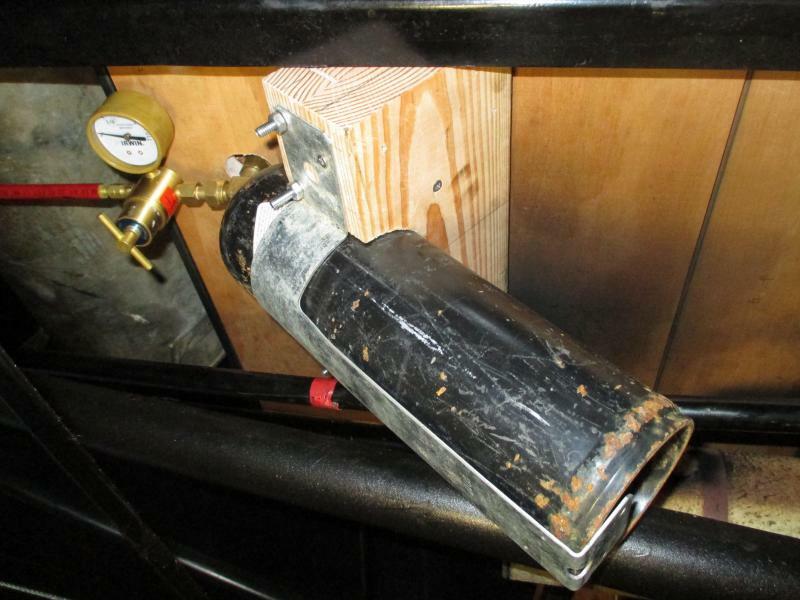 I believe you will want a tight fit of the new adapter into the modified Model T reflector. I.e. expand the hole slowly so it fits nice and is not lose. 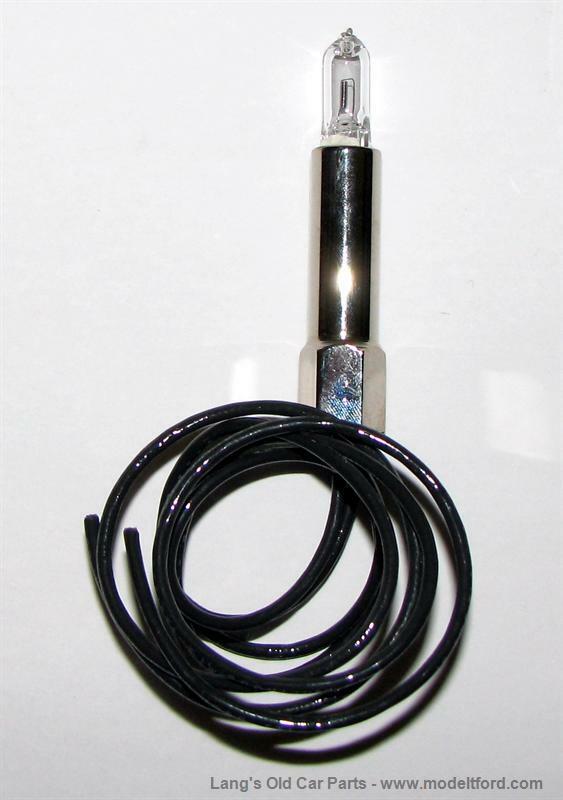 After the hole has been enlarged properly, insert the metal adapter into the reflector and use the black plastic part to go over the back of the adapter and to hold it into the reflector. The smaller part of the adapter goes through the hole leaving the large part for the bulb to be inserted into. Next insert the bulb into the adapter. Do NOT touch the bulb with your bare fingers. If you already did that previously – clean the bulb with alcohol etc. to remove all traces of oil that may have been left by your fingers. Those bulbs burn hotter than the old style bulbs and the oil from your fingers can make a even hotter spot on the bulb and cause it to fail. The bulb is now secure in the reflector. You can now connect the wiring from the three prong socket to the wires that will run to the light switch. 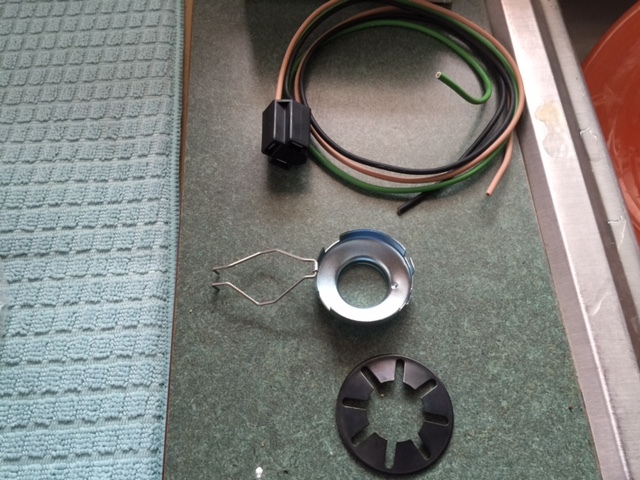 Once that is completed you can attach the black plastic socket with the wires onto the back of the halogen bulb. Hold the bulb with a clean cloth so you do not push the new adapter out of the original but modified reflector. Note you will want the bulb installed in a way that when you have the lights on dim the lights are lower and when you put them on bright the lights are a little higher. I haven’t worked with those bulbs to know which way they are installed. Also if you have the early 1926 set up you will want to be sure that even though the headlamp bucket is at an angle that the light still goes up when on bright and down on dim and not moving at an angle. Remember – I have NOT ever done this. So it may be all wet or some of it may be correct. But that is my best guess based on the limited information provided. In theory there should have been some instructions included. Again, if someone was standing next to your car – they wouldn’t have to ask so many questions. But we don’t know for sure what car, what headlamps, etc. you are working on. I put a thread in that we are working on a 14 roadster. For some reason it didn't post. we are using halogen headlamps. The kit that you have is designed to fit a metal reflector used 1915-1927 for Ts and the 1909-1914 gas headlamps originally had a glass reflector at the back of the headlamp. 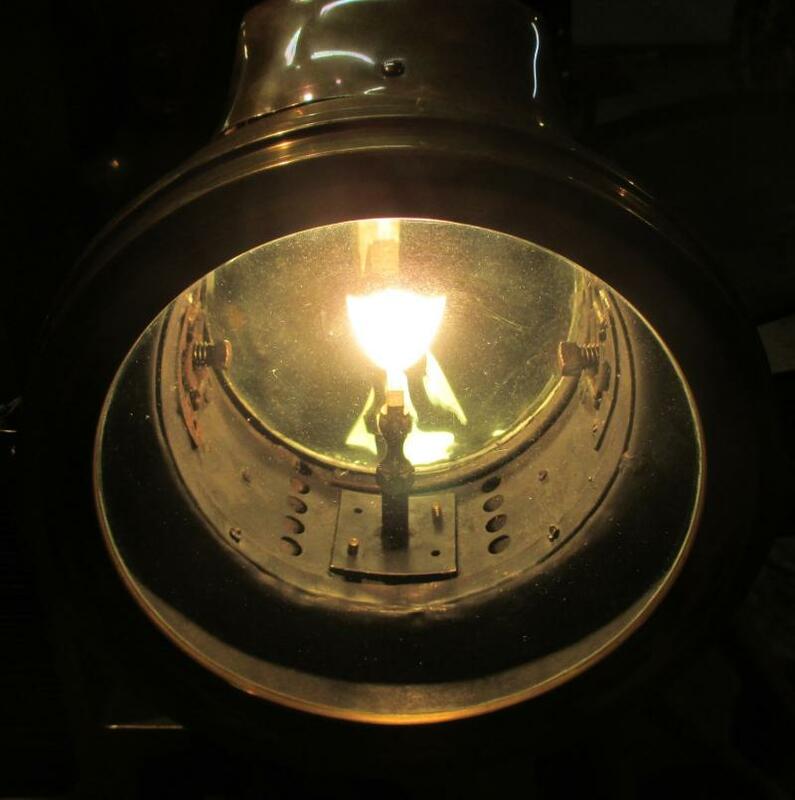 Were you planning to adapt the 1915-1927 style metal reflector to mount inside the Gas Headlamp and to hold the halogen adapter that would hold the bulb? Royce fit a standard 1925 reflector in his 1913 to hold an electric bulb see: http://www.mtfca.com/discus/messages/29/32041.html?1182984591. I'm not sure what combination he used on his 1912 at the posting: http://www.mtfca.com/discus/messages/118802/167363.html?1288202160 But you could send him a private message via the forum and ask him. ...and run your headlamps off of acetylene!